Welcome to the Official NC A&T NBLSA page. Here you will be able to connect with us and follow our campus involvement. The North Carolina A&T National Black Law Student Association. 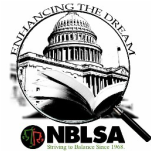 The National Black Law Student Association (NBLSA), was established by the Liberal Studies Department at North Carolina A&T State University in 2014. Students interested in learning more about this prestigious national organization may review the 2015-2016 membership guide by clicking on this link. Additional information about the many benefits, scholarships, and opportunities NBLSA provides can be found at the organization's website.